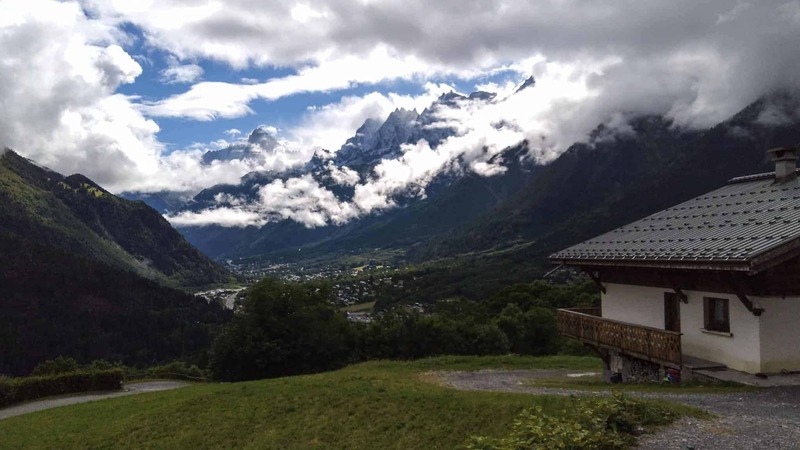 We hiked the Tour du Mont Blanc in July 2017 over 11 days, including one rest day. 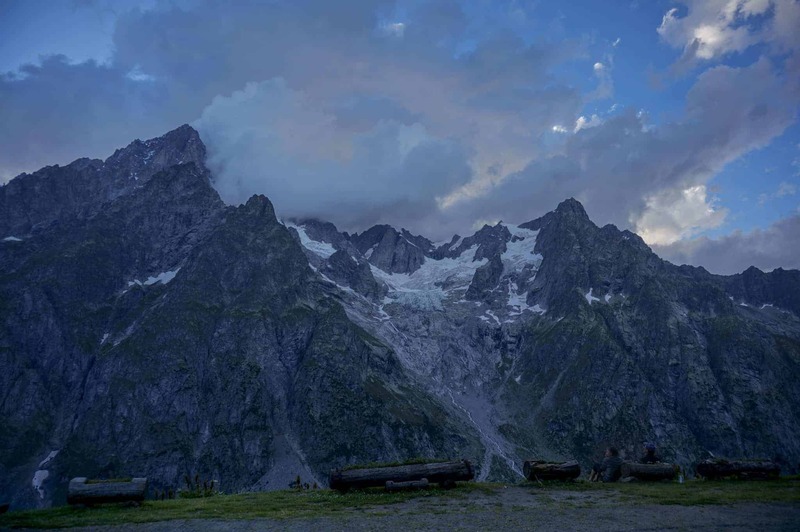 We camped the majority of the nights (see our guide to camping the Tour du Mont Blanc here) and stayed in a few fantastic Refuges and hotels along the way. You can find a plethora of information about the route on the internet and available through the recommended Cicerone guidebook, but the goal of this photo-filled trip report is to provide inspiration and motivation for folks considering embarking on this great adventure! We’ve included some basic information and reflections on each stage, but our main focus of this post is showing off some of the amazing scenery you will encounter on the Tour du Mont Blanc! If you’re wondering what we packed for this adventure be sure to check out our packing list here! 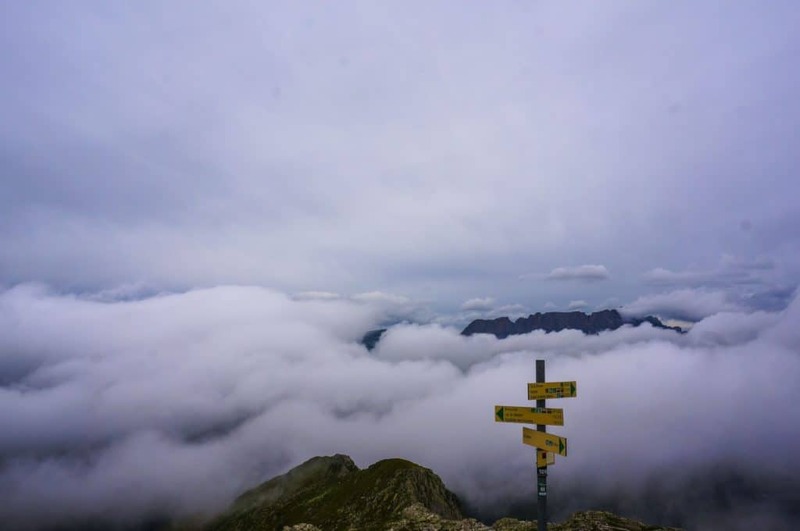 We spent most of our first day walking through the clouds and a light drizzle, but even the weather couldn’t dampen our excitement of starting the TMB! 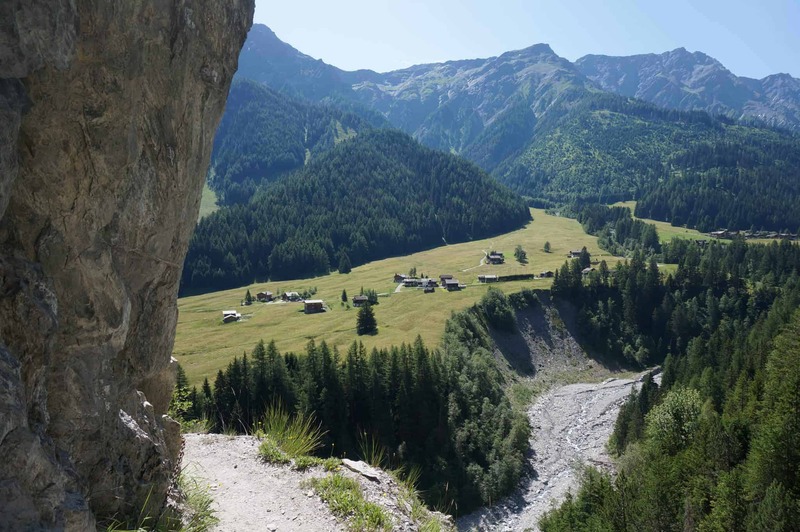 The hike up to Col de Voza is certainly steep, but the decent takes you through several lovely villages on your way to Les Contamines. A word of caution: We were so caught up in the beautiful scenery that we missed a turn and walked for almost an hour out of our way! (Luckily, we made use of our GPS app to get back on course). While the scenery is stunning, it is important to keep alert for direction signs, especially in towns! The view back towards Chamonix as we walked uphill out of Les Houches. The weather wasn’t any more cooperative than it was on the first day, but the low hanging clouds made the landscape feel even more surreal. The climb up to Col du Bonhomme was one of the steepest on the entire TMB, with the weather threatening to snow at any moment. Luckily if you find yourself in similar weather there is a beautiful Refuge at the top of the Col to warm up and enjoy a meal. The weather began to clear on our decent into Les Chapieux – a wonderful sign for the days to come! 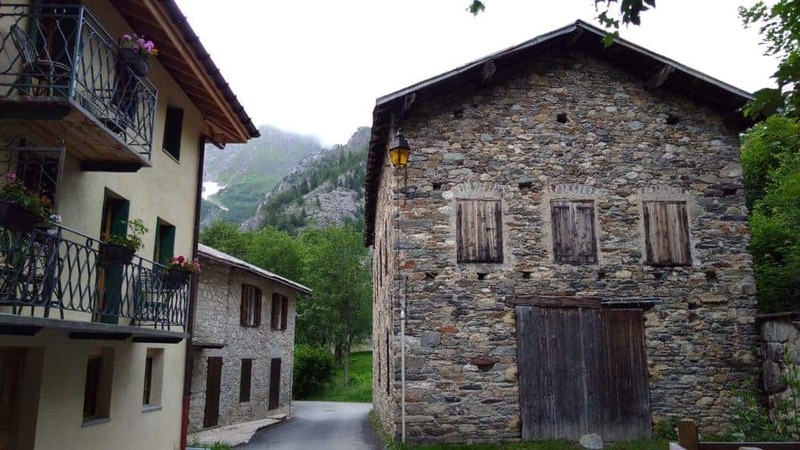 We found Les Chapieux to be a charming hamlet and enjoyed a celebratory beer at the Auberge de la Nova with our fellow hikers before camping for free in the adjacent meadow. Cows along the route to Col du Bonhomme. The lovely hamlet of Les Chapieux. Since we were trying to camp as much as possible along the route we chose to combine stages 4 & 5 as we weren’t sure about camping near Rifugio Elisabetta. This meant a 33km(!) day that we estimated would take us 10 hours! Luckily for us there is a bus that runs from Les Chapieux up the road to Refuge de Mottets. We were disappointed to not have walked the entire TMB, as this decision cut out a couple hours of walking along the road, but we thought it would be well worth it given our long day. Boy were we glad we made that decision! 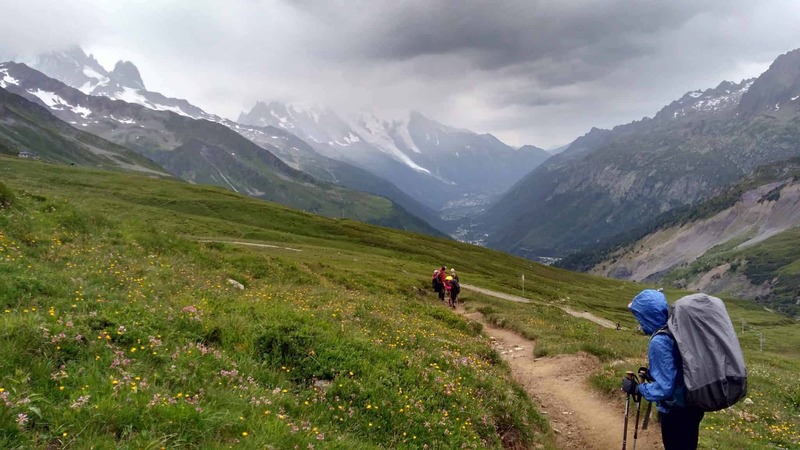 While the hike itself was certainly long, the beautiful scenery of the south side of Mont Blanc and the Val Veny kept us going with great spirits. That is until we reached the long, steep, final section of downhill that leads you into Courmayeur. Our tired legs and very tired knees barely made it down the seemingly never ending steep descent into Courmayeur. This is definitely a section that the guide book fails to warn hikers about – so take our word for it and be prepared for a long downhill! 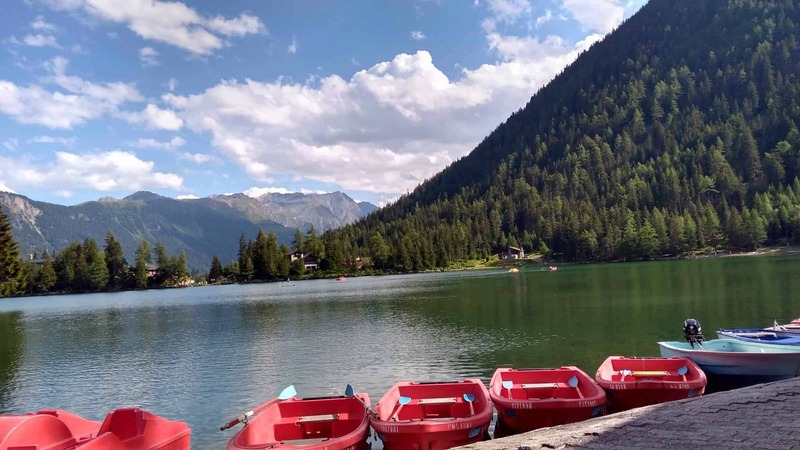 Although the hike ended up taking us close to 9 hours, it was worth it to have a rest day in Courmayeur to enjoy the beautiful town and relax a bit. We would certainly recommend this option for very fit hikers, or those who are on a tight timeframe. But be warned, it makes for a very long day so if you have any doubts about it we would recommend the traditional route. Views of Mont Blanc from the Italian Val Veny. Pasta and gelato says it all! What else could you possibly want on a rest day in Courmayeur!? Looking out over the rooftops of La Saxe. We found this day to be very enjoyable – a steep uphill climb to start the day followed by a lovely walk along the side of Mont La Saxe. We opted not to take the alternative route but those who did reported that it was a very, very challenging hike with gorgeous views. 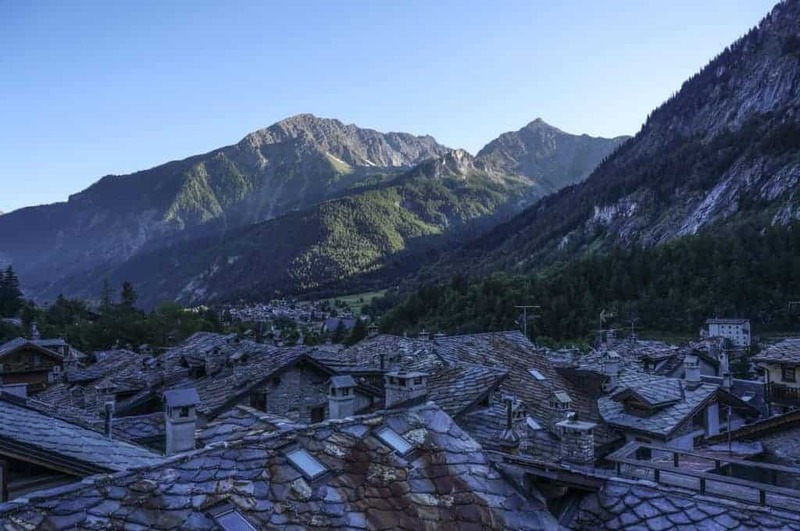 If you opt to take the traditional route like we did, this is a great day to take your time on the trail and really enjoy the scenery (especially if you’ve just had a rest day in Courmayeur). 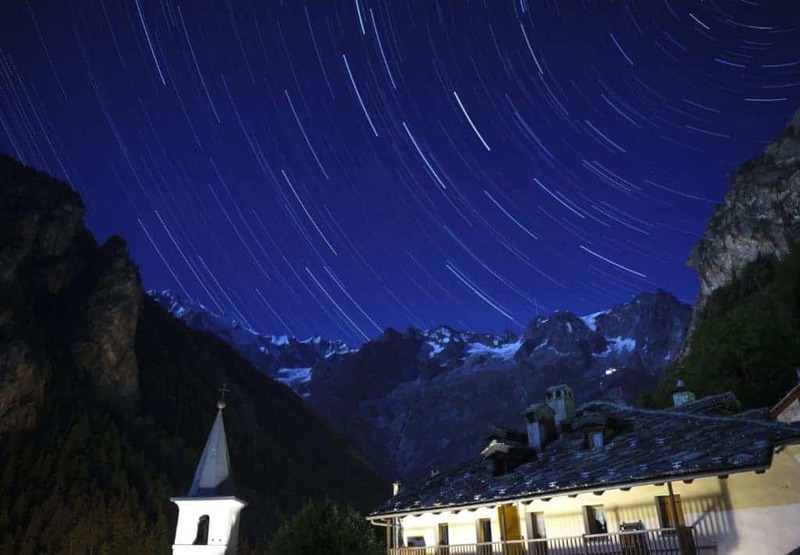 If you are camping the entire trip your itinerary will look slightly different than ours, but we stayed at Rifugio Bonatti and found it to be a great Rifugio in a spectacular setting! One word of advice: bring earplugs! All it takes is one snorer to keep a whole room awake! 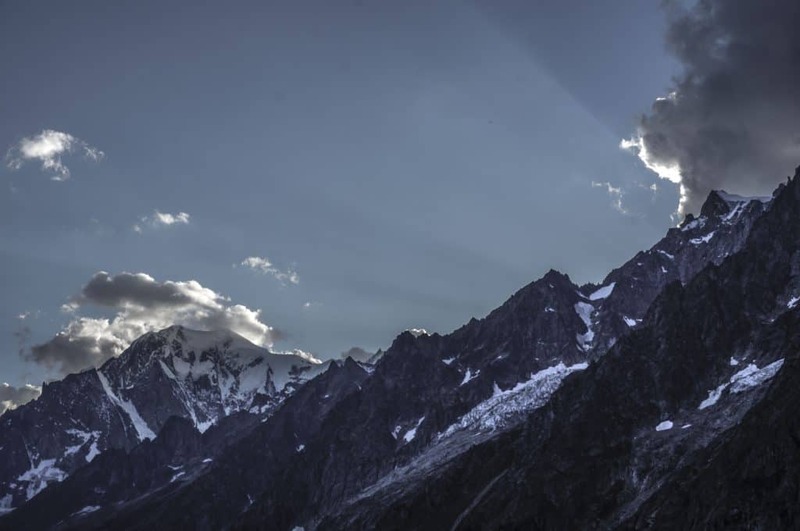 Early evening views of Mont Blanc. Taking in the Grandes Jorasses from the Rifugio. 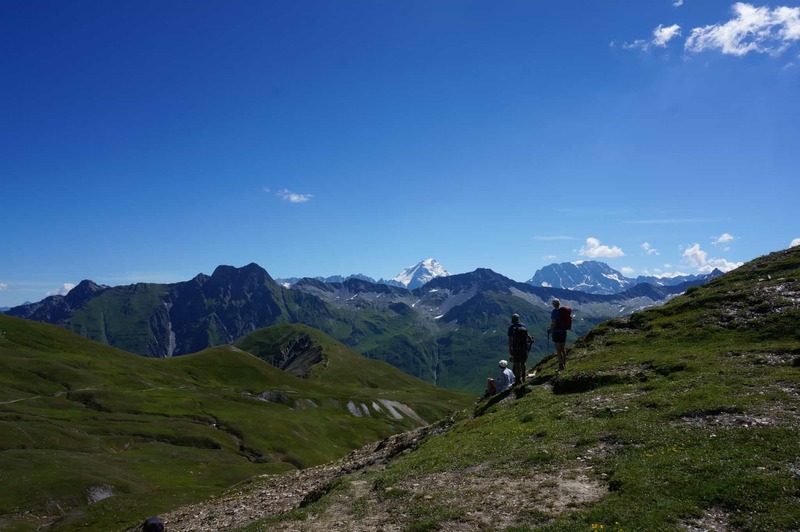 The TMB crosses into Switzerland on this day and you bid farewell to Italy with a steep ascent of Grand Col Ferret. We found the top of the Col to be a lovely spot to enjoy lunch and the incredible views. 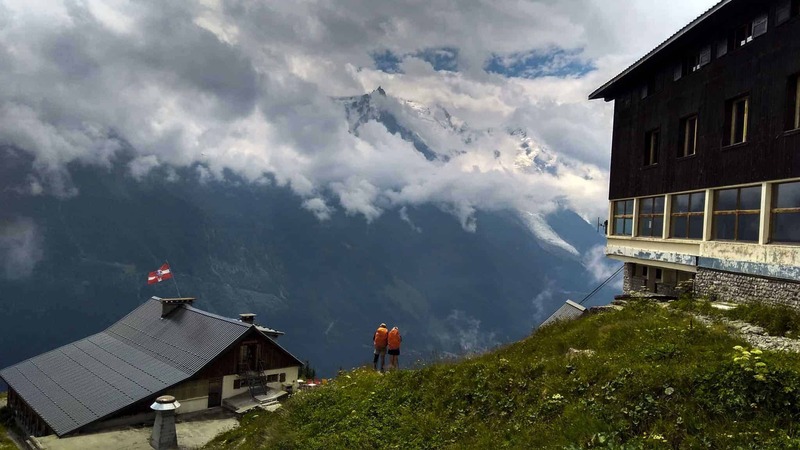 The atmosphere at the top of the various Cols on the Tour of Mont Blanc is one not to be missed – hikers heading both directions stop to enjoy the views and reward themselves for the steep climb they have just accomplished. 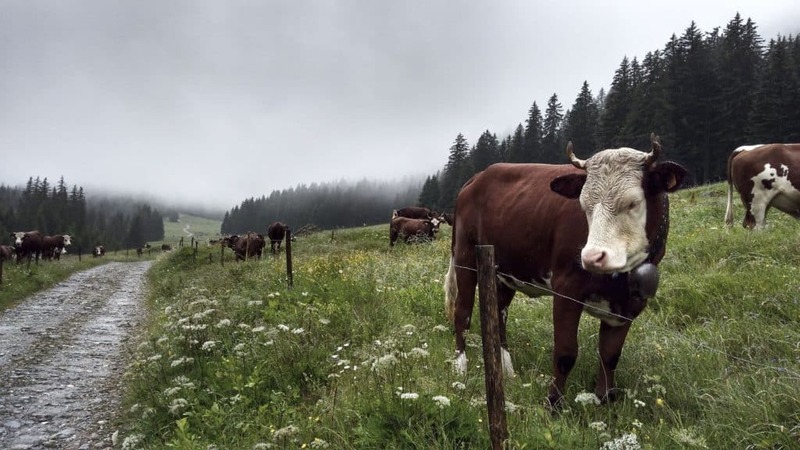 Your first stop past the border is the lovely dairy farm of La Peule where the atmosphere feels quintessentially Swiss. From here the route turns north and you head towards La Fouly’s quaint shops and restaurants, where you’ll be lucky enough to spend the night. Catching a first glimpse of Switzerland from Grand Col Ferret. 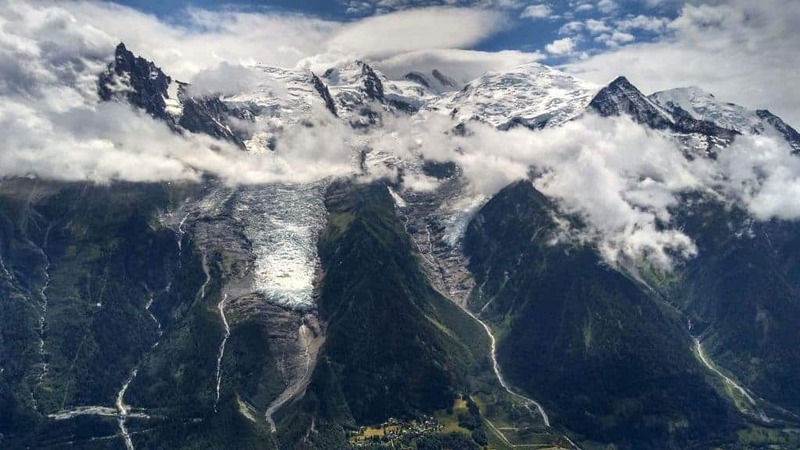 Don’t be fooled by what the Cicerone guidebook describes as the “easiest stage of the TMB.” While we would agree that it is the easiest day on the Tour of Mont Blanc that doesn’t mean it is an easy day. It’s like saying the swim is the easiest part of an Ironman or Dumbo is small for an elephant. It’s all relative. We found the start of the walk to be very enjoyable as we wound through a lovely Swiss valley, passing through small hamlets along the way. 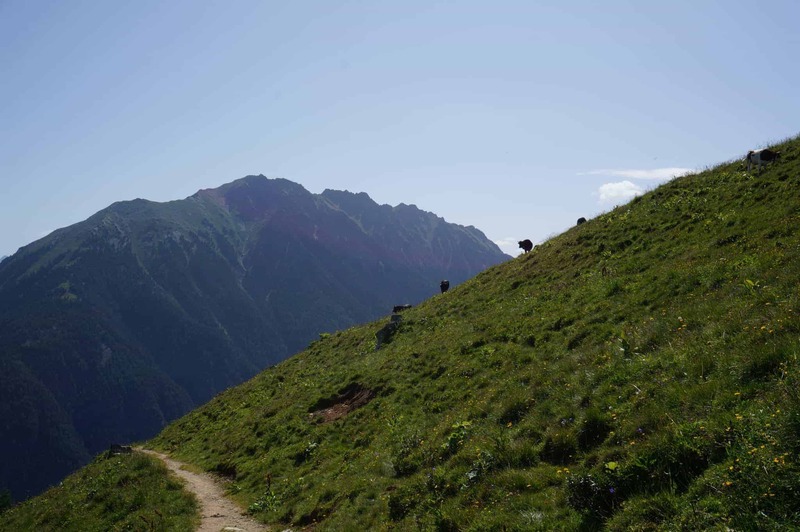 We were prepared for the steep climb to Champex at the end of the day, but we talked with many hikers who had been taken by surprise and found it to be very difficult. While the climb won’t compare to many of the Cols we’d crossed to get to this point it is definitely nothing to underestimate! Once we arrived in Champex, we did a little “extra credit” walking through the entire town to get to our campground. Then we grabbed a beer on a lakefront patio and found some local cheese and bread to enjoy that night for dinner. We highly recommend you do the same! The trail hugs a steep cliff as it makes its way through Val Ferret. Due to some unsettled weather we opted to take the traditional route to Col de la Forclaz, as opposed to the more exposed alternative route. Today’s route brings you back into high alpine country, and we enjoyed our stop at the Bovine Alp for some mid-hike refueling. Throughout the hike, you have fantastic views of Martigny down in the valley below and the stage is a fitting farewell to Switzerland as you prepare to cross back into France the next day. 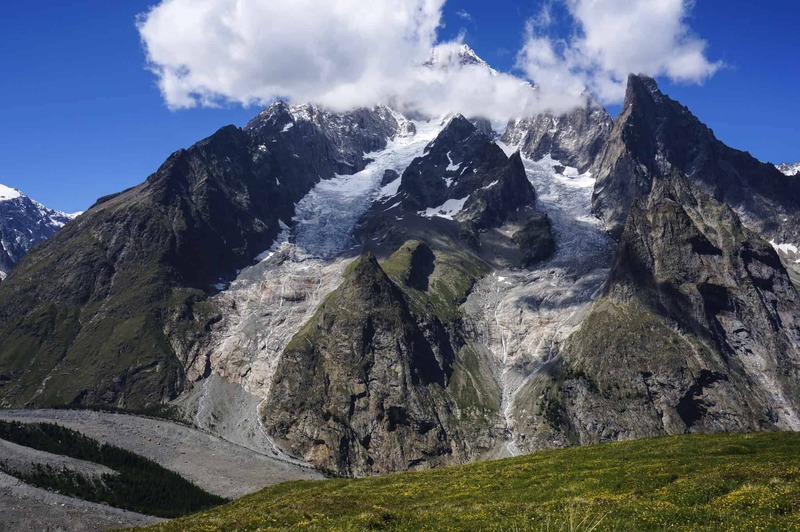 As we detailed in our post on camping the Tour du Mont Blanc, we opted to continue down the trail from Col de la Forclaz and camp in Le Peuty. We arrived on the early side and found the camping area, and indeed the entire town, to be completely deserted. The camping area is just a field with a picnic table, so we weren’t sure if it was okay to pitch our tent there. After shuffling around awkwardly for awhile and gazing into the distance in hopes of seeing another campground or in-the-know hiker, we decided to go for it. Luckily, we guessed right and other confused campers soon took the plunge too. Don’t worry, if you decide to camp here, our camping guide will help you look like an expert. The Bovine Alp on the way to Col de la Forclaz. We woke up early today to some serious thunderstorms, but luckily our little tent was up for the challenge. From Le Peuty, the TMB winds its way uphill until you reach the cozy Refuge du Col de Balme. 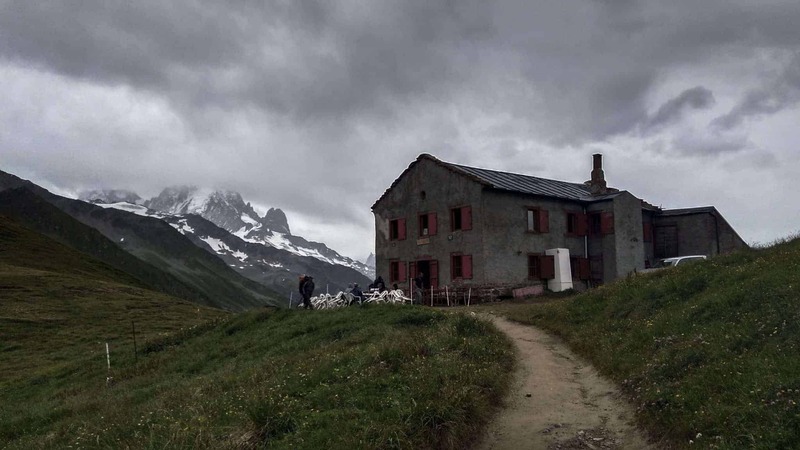 We really enjoyed this refuge because it’s a little less “polished” than most of the European mountain huts we’d encountered and had a more old-school Alpine feel (think wood-burning stove, floral wallpaper, outhouse, homemade pie). At the Col de Balme, we made our final border crossing into France. From the Col, we resisted the temptation to take more scenic Aiguillette des Posettes option, due to the threat of encountering storms on the exposed route. Instead, we took the most direct route down to Tre-le-Champ. The guide and the blogs we read didn’t give us much information about camping in this area so we didn’t know what to expect. After only a little bit of aimless wandering, we happened upon the magical Pierre Semard campground in Les Frasserands (just down valley from Tre-le-Champ). Named after the leader of the French Communist Party, this campground was friendly, lovely, and affordable. Refuge du Col de Balme. Making our way down to the Vallee de l’Arve. We spent most of the hike to La Flegere walking through an eerily beautiful cloud. While wide-open views can be incredible, there is an added layer of beauty and mystique when one is catching glimpses of imposing mountains through wisps of soft gray clouds. To add to the excitement, this stage of the hike included about 1km of ladder-climbing and scrambling to reach the high point. The rainy weather did not make this part as lovely, since the ladder rungs became a bit muddy and slippery. One of us is a trooper when it comes to heights, but lets just say that the other hiker in our group didn’t have too much fun. If you are truly terrified of heights, we’d strongly recommend taking the alternate route. For the more adventurous souls, this segment is very cool. 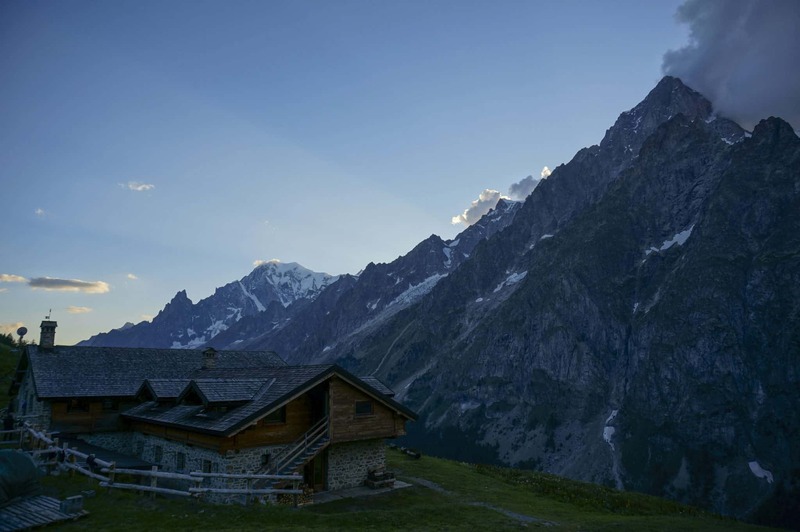 We decided to stay in the Refuge La Flegere instead of camping, and we were glad we did. We couldn’t have been happier as we shared a delicious dinner with new friends and watched the storm rage from inside the cozy hut. The final day came too quickly! We woke up to a clear, beautiful morning and freshly baked croissants at the hut. The day only got better from there. 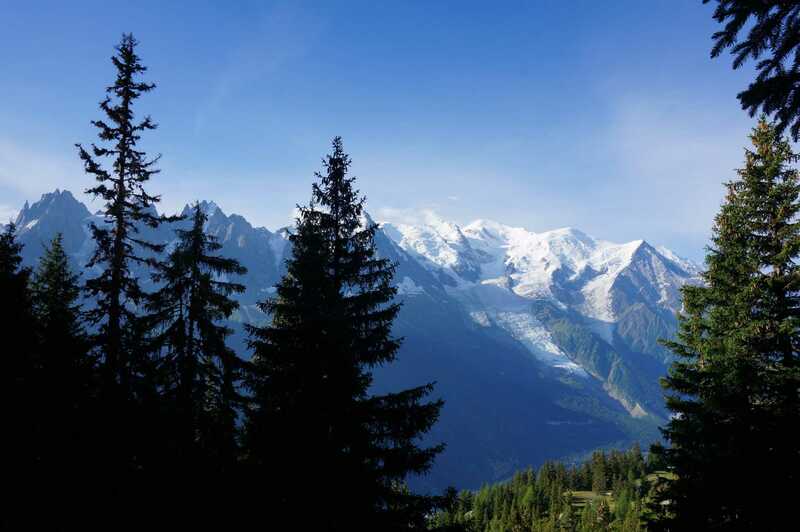 The views of Mont Blanc are truly breathtaking on this stage of the hike. We decided to really take our time and savor every moment of our last day of hiking. We stopped at the charming Refuge de Bellechat for a fantastic cheese plate before beginning the long descent to Les Houches. Although the Cicerone book warns that this downhill stretch is the most “knee-wrenching” of the route, we found it to be considerably easier than the descent into Courmayuer (admittedly, we hadn’t been hiking for seven hours already when we started this one). When we arrived in Les Houches, we used the last of our Euros to buy celebratory beers and bus tickets back to Chamonix. While the satisfaction of paying in exact change was pretty rad, it didn’t begin to compare to the feelings of accomplishment and adventure that we enjoyed upon completing such an incredible experience. Spectacular views of Mont Blanc on our final day. Mont Blanc making it nearly impossible for us to leave. Be sure to check out all of our Tour du Mont Blanc posts below. How to find all of your campgrounds on the TMB – Know where you are and where you’re going! Hello, I’m having trouble locating Refuge du Col de Balme on Google Maps. Does it have another name that I should be searching for? I’ve seen it written as Refuge de la Balme on other sites, but that didn’t yield an accurate map result. Let us know if you have any trouble finding it!